For 4-5 people. Ideal for a couple with 2 children or 2 couples with one or maximum two children. Possible sleeping up to 6 people. Beyond would not present the level of comfort which the tenant can claim the tenant. - 2nd level: bedroom (with seat and retractable bed, convertible into 2 beds or a bed for 2 persons 160cm), bathroom (toilet and sink), small balcony. Front of the cottage: southern exposure overlooking mountains (Aravis). Quiet (back from the county 16). Path 'in the Rock' also serves several other chalets. - 1st floor: bathroom with bath and washbasin (toilet in separate room) - 2nd floor: bathroom with toilet and sink. Nous avons passé une belle semaine à Manigod. 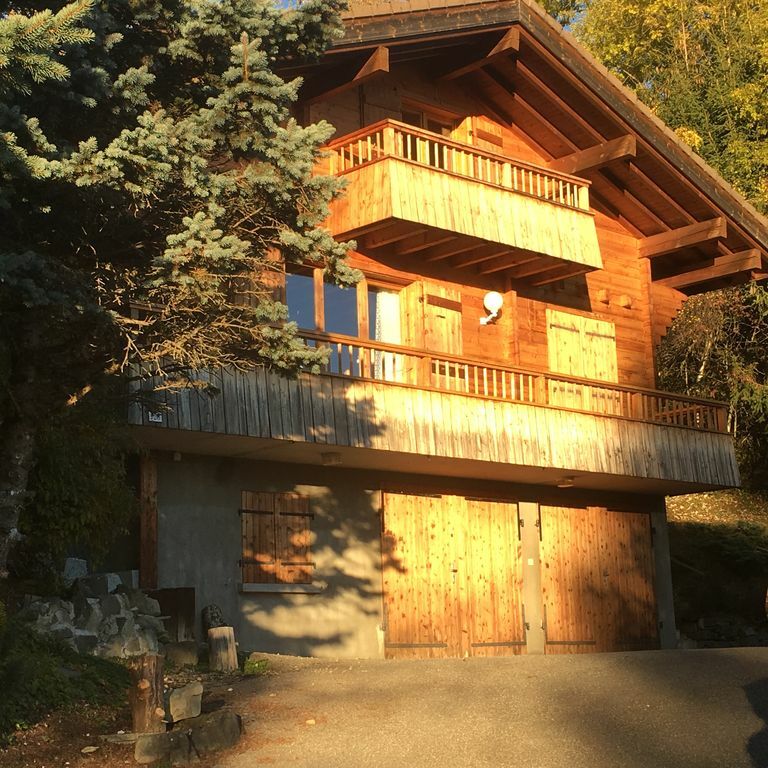 Le chalet est très bien situé et bien équipé! Nous avons bien été accueillis .Nous reviendrons! Magnifique vue sur les montagnes , très bien chauffé , lecture/DVDs/jeux sur place appreciés par les enfants.Tout ce qu’il faut pour cuisiner ce que l’on veut , et décoration chaleureuse. Je le recommande vivement pour un couple ou 4 personnes. Chalet Manigod between approx. 5 km away and the ski area of ​​La Croix Fry approx. 2 km (provincial road 16). Lake Annecy: 33 Km (in summer: beaches including Annecy, Menthon St Bernard Verrier du Lac, Talloires, etc.). The neck of La Croix Fry has its own ski school and is connected to the ski areas of Etale and La Clusaz. Although in winter a shuttle connects Manigod and Col de la Croix Fry, stopping at the intersection of 16 Departmental and 'Path' Under the Rock ', a car is preferable. Large parking in La Croix Fry or Etale. Downhill and cross-country skiing (the Plateau de Beauregard and 'Confines' in La Clusaz). Many excursions for hikers in late spring, summer and early fall. Annecy and its lake, the plateau of Glières Talloire, among others, deserve a tour. Shops Thones approx. 13 km (including supermarket, bakery, butcher, doctors, pharmacy, laundry, tourist office, cinema, etc. + commercial area at the entrance of Thones) or La Clusaz (including supermarket, bakeries, butchers, doctors, pharmacies, Sports shops and ski rental, ski school, tourist office, restaurants, cinema, swimming pool in summer and winter, etc.) approx. 14km ​​as well as the Etale (supermarket, bakery, restaurant, swimming pool in summer) approx. 4km, or Manigod (supermarket, bakery, bar, doctor, etc.) approx. 5 km. Note the 'Fête du Lac (Annecy) the 1st weekend of August with magnificent fireworks.